The HD10AVA is a miniature, high-quality, audio/video, HD/SD A/D converter. The HD10AVA automatically detects the video input format and embeds the audio inputs in the SD/HD-SDI outputs. The HD10AVA is useful for adding an SD/HD-SDI audio/video output to tape decks or any professional video equipment with analog outputs. 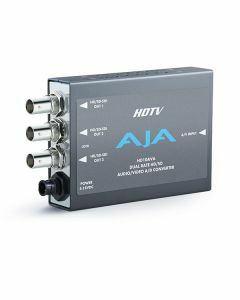 The HD10AVA is especially useful for adding HD-SDI outputs to most HDV cameras or decks by using the component outputs of such devices. The HD10AVA is a miniature, high-quality, audio/video, HD/SD A/D converter. The HD10AVA automatically detects the video input format and embeds the audio inputs in the SD/HD-SDI outputs. The HD10AVA is useful for adding an SD/HD-SDI audio/video output to tape decks or any professional video equipment with analog outputs. The HD10AVA is especially useful for adding HD-SDI outputs to most HDV cameras or decks by using the component outputs of such devices. The HD10AVA uses a breakout cable for audio/video inputs and provides 3 SD-HD-SDI outputs on BNCs. The HD10AVA is a miniature, high-quality, audio/video, HD/SD A/D converter. The HD10AVA automatically detects the video input format and embeds the audio inputs in the HD/SD-SDI outputs. The HD10AVA is useful for adding an HD/SD-SDI audio/video output to tape decks or any professional video equipment with analog outputs. The HD10AVA is especially useful for adding HD-SDI outputs to most HDV cameras or decks by using the component outputs of such devices. The HD10AVA uses a 3x BNC, 4x XLR breakout cable (included) for audio/video inputs and provides 3 HD/SD-SDI on BNCs. Note: The HD10AVA does not up or down convert between HD and SD.